The Nabucco Intergovernmental Agreement that was signed by representatives of transit countries Turkey, Bulgaria, Romania, Hungary, and Austria, represents a huge symbolic step toward diversifying EU energy supplies. The project should carry gas reserves to Europe from the Caspian Sea region, Iraq, and the Middle East -- and not from Russia, currently the EU's biggest and most capricious supplier. 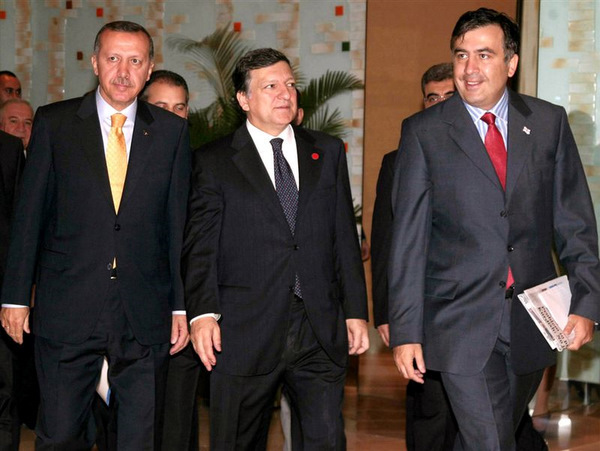 At the ceremony, European Commission President Jose Manuel Barroso called Nabucco "a truly European project" that "will provide energy security to Turkey, to Southeast Europe, and to Central Europe." "I sincerely believe we are starting to confound the skeptics, the unbelievers," Barroso said. "Some time ago people said that this project would not go ahead, that the negotiations seemed irrevocably blocked. Now we have an agreement and I believe this pipeline is now inevitable rather than just probable." EU officials insist Nabucco's intention is not to pick a fight with Moscow, but they make no secret of the fact that Russia's reputation as a supplier has taken a beating following repeated gas spats with Ukraine -- and that finding reliable alternatives is now an EU priority. The 3,300-kilometer Nabucco pipeline -- which should run from eastern Turkey to the Austrian capital, Vienna -- is expected to come online in 2014. When fully operational, it could carry 31 billion cubic meters (bcm) of gas annually and supply between 5-10 percent of the EU's projected gas consumption in 2020. Russia, the bloc's largest external supplier, currently provides around 40 percent of the EU's gas. "The consequences of the Nabucco project will reach far beyond simply laying down a pipeline and filling gas into it," Hungarian Prime Minister Gordon Bajnai said in Ankara, hinting at the broad impolications for the 27-member EU. "This will have very significant, positive consequences in the economic, social, and political sense for all of our citizens." Nabucco has always been seen to have a political dimension, and Russia's reliability as a provider has suffered in recent years, with many new EU member states distrustful of Moscow's motives. But the European Commission's energy spokesman, Ferran Tarradellas, told RFE/RL last week that moves to diversify EU energy supplies did not mean the bloc was turning its back on Russia. "Nabucco is going to make a contribution -- it's going to [deliver] gas from different sources, through different transport routes, and therefore it's going to bring more security of supply, more freedom of choice to European markets," Tarradellas said. "But this doesn't mean that we're not going to go on working with Russia. On the contrary, Russia is very likely to remain our main supplier of gas and Nabucco has never been a project against Russia." Tarradellas said the EU has been "very transparent with our Russian friends." Senior Russian officials have stated publicly that the EU's efforts to lessen its energy dependence on Moscow are driven by "Russophobia." Privately, EU officials argue that regardless of Russian objections, the bloc must look out for its own energy security. They point out that most eastern member states are wholly dependent on Russian gas. "You know our history with Russia and Ukraine," one senior European Commission official commented recently, alluding to the recurrent price disputes between the two countries which saw half of the EU's member states suffer debilitating gas shortages as Russia turned off the taps in January. Briefing journalists in Brussels, the official intimated more than once that enhancing EU member states' security of supply and lessening their reliance on Gazprom amount to the same thing. The benefits of Nabucco in this regard, he said, will be felt from "Greece to Hungary" and in the Western Balkans, and will extend as far as Poland, Germany, and France -- all of which will have access to the gas transported to Europe via the pipeline. Nabucco has long been hampered by a lack of commitment from both suppliers and investors. European Commission spokesman Tarradellas said the South Caucasus region will be key to Nabucco's long-term prospects, from the growing importance of Azerbaijan as "the origin of the first gas" to the "very important" Georgia as a "natural transit country." Searching for the initial 8 bcm of gas needed annually to start up Nabucco, EU officials are looking to Azerbaijan's Shah Deniz II gas field, projected to go online in September, to provide the necessary start-up volumes. Azerbaijan's recent 500 million cubic meter deal to sell gas to Gazprom does not appear to worry Brussels, where officials say the deal is just a small portion of Azerbaijan's overall gas output. EU sources also say Azerbaijan's government thinks that country could produce "far more" gas than the 8 bcm needed to make Nabucco viable. There is talk of a possible 30 bcm being available from Azerbaijan alone by 2015. Given the mounting geopolitical risks in the South Caucasus, however, EU decision-makers are exploring alternatives as well. Should anything go wrong with the South Caucasus transit corridor, Iraq is said to be in a position to step in and supply the minimum 8 bcm needed annually. Iraqi Prime Minister Nuri al-Maliki was attending the Ankara signing ceremonies. But EU officials at this stage are loath to talk about fallback scenarios. The bloc is setting its sights much higher, hoping to reach beyond Azerbaijan to the massive reserves held by the Central Asian states. 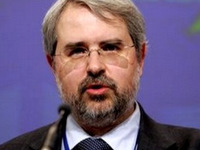 European Commission spokesman Tarradellas said Turkmenistan is the next natural target for Nabucco after Azerbaijan. "Turkmenistan has large reserves that have been proven, so probably it's going to be the next country that is going to be an important player on the Southern Corridor project," Tarradellas said. "We have also contacts with Kazakhstan and with Uzbekistan as possible future suppliers." Turkmenistan has at least one gas field with a proven capacity of 4 trillion-14 trillion cubic meters -- enough to keep Nabucco operational at its currently projected levels for at least 120 years. The EU is working with Azerbaijan and the Central Asian countries to set up a Caspian Development Corporation (CDC), a commercial enterprise tasked with establishing transit routes -- possibly a pipeline -- across the Caspian Sea. A senior EU official viewed the undertaking through the prism of Gazprom's current dominance in the region, saying, "The CDC will give Turkmenistan the strategic option to turn away from the dominant player, Gazprom." But Brussels is now playing down earlier promises extracted from Ashgabat to guarantee the EU 10 BCM a year. This was a "political commitment," the official said on July 10. He said the Central Asian countries would always keep their options open until the last possible moment to maximize their bargaining power and commercial advantage with regards to all prospective buyers. The Brussels-based official also described Nabucco's main impact on Turkey in terms of reducing that country's dependence on the current dominant supplier, Gazprom. Nabucco's gas flow, the official said, will be reversible, enabling Turkey to switch at will from Russian supplies to gas coming from the North Sea, Algeria or Libya. Should Nabucco fail to tap into the Central Asian gas reserves, prospects for its large-scale expansion will remain bleak. The EU source said there are "no great hopes" for the Pan-Arab Pipeline which connects to Turkey via Syria, as most of the Middle Eastern gas is expected to move south. Iran, with its large reserves, is not a "desirable" partner for Nabucco in the current political climate, in the words of the EU official. He also underlined the fact that Iran presently imports gas. Given that the South Caucasus Pipeline from Azerbaijan to Georgia can currently handle only 10 bcm a year, there exists an obvious transit bottleneck. Officials in Brussels say the capacity of the pipeline could be doubled but decline to comment further. "The EU has no preference" as to the location or contractors of any other prospective pipelines, said one senior source. The bloc's casual stance could undermine prospects for the White Stream pipeline project, to run under the Black Sea from Georgia to Romania, recently elevated to the status of a priority EU project. Officials say Nabucco with its current prospects will offer a "very good" rate of return at a low risk. The EU itself has agreed to bankroll 250 million euros of the estimated total cost of 7.9 billion euros.